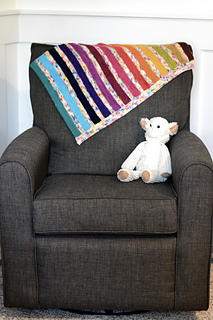 Snuggly and bright, Under My Rainbow will cover the tiny human in your life with color. This blanket is knit in one piece and can be made with a choice of mini skeins or one solid skein, mixed with a variegated yarn. It’s the perfect size to cover a stroller, car seat or your little one as they nap in their crib. 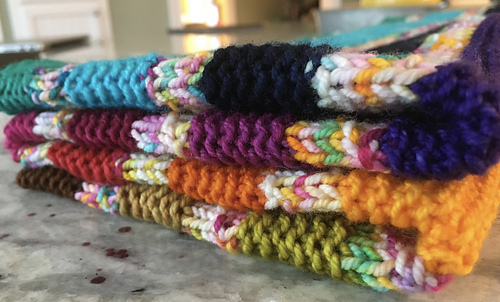 Knit your very own rainbow and snuggle under it with your favorite tiny person! 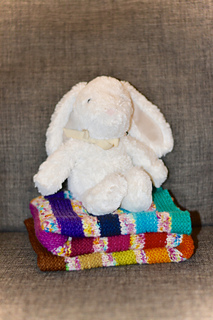 The sample above is shown in Knitted Wit’s Victory DK (MC) Funfetti, (CC) Happy Birthday (13 mini skeins/40 yards each). Yarn kits are available from Knitted Wit here.